MPs have given themselves a 2.7% pay increase. It doesn't sound much, but for them it means a rise of over £2,000 a year - more than many members of civil servants' union PCS take home in a month. For us, the government's own workers, it is another year of pay caps and pay misery to look forward to. Surely what's good enough for MPs is good enough for us. This is why it is vital that our members back the union's 2019 pay campaign. A ballot will run from 18 March to 29 April. 124,000 members in the civil service and related public bodies will get a vote. The ballot is for a mandate to take strike action in support of the union's pay demands. These include a 10% pay rise (£2,400 cash underpin) and the restoration of national bargaining on pay and employment conditions. Failure to meet the 50% turnout threshold prevented the union taking action in 2018. Despite a massive yes vote - 50,726 to 8,528 - the turnout was only 42%. PCS assistant general secretary and Socialist Party member Chris Baugh says: "Busting the 50% turnout and a massive yes vote for strike action will put huge pressure on this weak and divided government and will force them to take our demands seriously. "Many reps meetings have made it clear that they remain determined to do this. 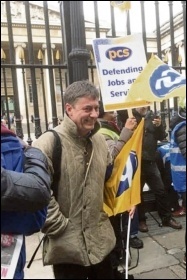 PCS activists again have a key role to play. "The government's failure to take our demands seriously should lead to national strikes and targeted action. "The latter will be supported by the strike fund - which the union is taking steps to substantially supplement through a 50p levy on members' subs on top of the £1 million allocated from the High Court victory against the Department of Work and Pensions for removing check-off - the right of PCS members to pay their union subs directly from their salaries." The elections for the PCS assistant general secretary and the national executive committee will overlap with the union's pay ballot - 16 April to 9 May. And PCS branches are currently nominating candidates. Chris Baugh is the assistant general secretary candidate for Left Unity, the union's broad left. Nominations close 7 March but it is already clear that Chris will receive many more nominations than the minimum 15 required to stand. Chris has widespread support among the lay activists in the union. This gives good reason to believe Chris will win. He is expected to be opposed by an ultra-left candidate and a PCS full-time official. The latter is shamefully backed by the Socialist Workers' Party and some others in Left Unity. Chris Baugh and those who support him will be campaigning for his own election and the whole of the Democracy Alliance slate, which Left Unity is part of. Victories on pay and the elections are our twin priorities in the weeks that lie ahead.